At Renewal by Andersen® of Northwest Ohio, we understand that window replacement can be stressful for a homeowner, especially when it’s your first time. To make this a stress-free and easy project for you, we have made the process a breeze. You’ll enjoy a cozier and lovelier home in no time. Today, we provide you with a detailed look at the way we do things to ensure we’re on the same page. Our team will arrive at your home to determine your needs, evaluate your preferences and help you come up with the perfect solution. We will then take measurements of your window openings so we can design and custom-build the replacement windows that fit your unique requirements. We will return to your home on the day of your scheduled installation with your new windows and the right tools for the job. As part of our safety measures, we’ll carefully move your furniture away from the work area if you haven’t done so already. We’ll also cover the surrounding area with protective tarps and wear footwear covers so we don’t track dirt and debris in your home. We’ll then remove your old windows one by one. We do this one window at a time to minimize the escape of air-conditioned or heated air in your home, and to prevent drafts and dust from entering. After installing your new windows, we’ll test them to make sure they operate properly. There are times, however, when the opening has warped. In this case, we will make the necessary adjustments so your unit will fit just right. We will then apply a special insulation foam in the gaps between the window and the opening frame to eliminate drafts. As a finishing touch, we will cover the foam with trim. When we’re satisfied that your new windows are perfect, we will give you a demo and wait until you’re satisfied and happy with them as well. Our process doesn’t end after replacing your window. We always aim to finish our job with minimal interruption, which is why we clean up after ourselves. We’ll move your furniture back into position, clean the area and dispose of your old units. All is left is for you to enjoy the wonderful benefits of your new windows. 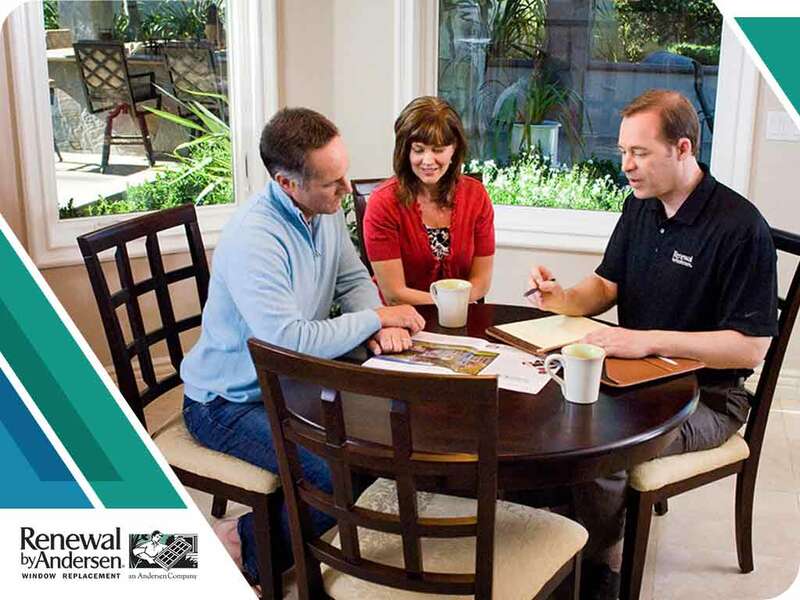 Renewal by Andersen® of Northwest Ohio is always ready to help you with your window replacement needs. Call us today at (419) 931-6087, or contact us here to get answers to any questions you might have about our window replacement products and our process, or to get your free quote. We replace windows in Findlay, OH.